ADVERTISING ON SOCIAL PLATFORMS · 10-MINUTE READ · By Misty Faucheux on March 13 2017. To ensure that we are reaching our audiences any place where they might be consuming media, marketers run paid campaigns on many different platforms. While individually we can tell the success of the campaigns, oftentimes we need to provide comprehensive numbers to our stakeholders – for example, overall impressions, clicks and engagement. Yet, most social networks use terms like “reach”, “follows”, “likes”, “retweets”, etc. So, how do you compare apples to apples on the different platforms? Social networks have always had diverse terminology for what actions on their platforms. Part of this must do with branding – to distinguish the one platform from its competitor. While calling a post a “Tweet” or a share a “Retweet” helped Twitter coin terms that became recognizable with its brand, it also created confusion for marketers trying to showcase their successes. Luckily, on the advertising side, many of the expressions that we’re used to on platforms like AdWords and Bing (think impressions and clicks) are consistent with the terminologies being used on platforms like LinkedIn and Twitter. Facebook, however, uses the term “Reach” or “People” to reference impressions. Yet, the meanings are quite similar. Facebook reach is the number of unique people who saw your content. It affects every other metric you can track: engagement, likes, comments, clicks and negative feedback. And that’s not all. There are different kinds of reach: post, page, organic, viral and paid. Facebook breaks down the difference even further, saying that impressions are the number of times a post from your Page is shown. Reach, however, is the number of people who received these impressions. Reach is going to be slightly dissimilar than impressions since one person can see multiple impressions, meaning that Reach is going to be somewhat lower than impressions. If we think about this in terms of AdWords, Reach is the equivalent of unique impressions. This allows us to then group unique impressions together. While Facebook won’t provide exact overall paid impressions, you can use Reach as an impressions metric. You can combine these impressions numbers with impressions from, for example, LinkedIn or Twitter to determine as close as possible total overall impressions. Embedded media clicks: Clicks on a photo or video embedded in the Tweet. Hashtag clicks: Clicks on a hashtag within the Tweet. Permalink clicks: Only available on desktops, it’s clicks on a Tweet permalink. User profile clicks: Clicks on the user’s Twitter handle, name or profile picture. If you are measuring these types of clicks, then they may be better served as “engagements”, not clicks. Overall, engagement is going to be more like brand awareness metrics. Engagement can include anything from “Likes” to “Follows” to “Retweets” to “Mentions”. I’ve seen many social media analytics reports separate these out. Yet, unless you are specifically trying to increase the followers of a page or person, then these engagement metrics mean little to stakeholders who often only want to know if this will convert into measurable ROI. In my experience, grouping these metrics together as overall “Engagement” or “Brand Awareness” is a better metric than the individual stats. Most of the social networks will provide an “Engagement Rate” percentage. You can total out the overall engagement rate across the different social networks and create a single column with this information. Then, you can add a percentage increase or decrease to show whether or not engagement is growing. For most clients and stakeholders, this is enough information and provides a better picture than individual engagement metrics. LinkedIn breaks down actions similar to AdWords. Facebook Reach is similar to unique impressions in other platforms. 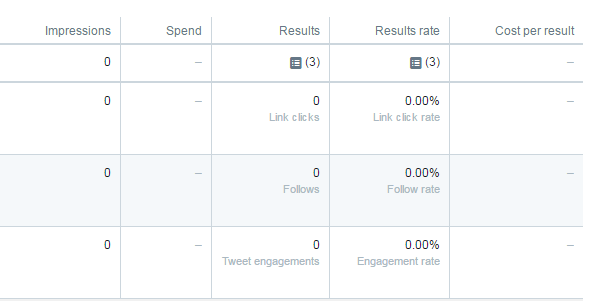 Twitter groups different actions in the Results tab, including clicks, follows and engagements. What Does Success Look Like on Each Platform? Honestly, this is going to depend on your goals. As mentioned, we can fairly neatly break out “brand awareness/engagement” goals from impressions and clicks. If your client is a new company that is looking to grow their Facebook page Likes, then engagement and overall impressions are going to be the most important metrics. Yet, for most clients, they want to know how their social media efforts are translating into ROI. This means that they’re interested in “Clicks” and “Conversions”. Facebook, LinkedIn and many other of the social platforms actually allow you to track Conversions within their platform as long as you have conversion tracking set up. These metrics can be combined with AdWords, Bing or similar conversions to provide a comprehensive picture of overall campaign success in a single view. You will always have stakeholders that want to see the individual breakdowns of each platform, which you should always have on hand. Many, however, want to see that their advertising dollars are being put to good use and that these efforts are leading to conversions at a reasonable cost per acquisition. Creating a comprehensive, single view report with all the metrics from all your individual campaigns provides the big picture that might be missing from individual social media or advertising reports. While you can create your own report, third-party companies (like Supermetrics) have created reports that make it easy to import your data and quickly compare statistics. You will more than likely have to tweak reports based on goals, especially if they’re subject to change. For example, you might want to focus initially on how you’re expanding overall brand reach. Yet, after month three, you will probably want to start showcasing conversions across funnels. Every platform has its place in the biosphere of digital marketing. Yet, spreading statistics across so many different platforms can cause confusion among stakeholders, especially with the varied terminology. Consolidating data into a single view with simply-termed metrics can improve stakeholder understanding and better display overall ROI and success metrics. Marketers should review each platform that they are using as well as the definitions of the individual metrics before combining metrics. You want to ensure that the stats are comparable before uniting them.